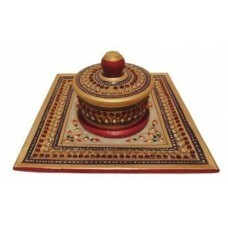 Delicate RoyaltyBox n Tray - Single (Marble)Dimension: L-6 x W-6 x H-3.5 Inches Approx. •T..
Dimension: L-6 x W-6 x H-3.5 Inches Approx. •Tray with utensils (with cover) – all in marble, adorned with enticing colourful motifs, in Kishangarh Art. • Can be used for multiple purposes like to serve dry fruits, for placing puja items in festive occasions etc. • Serve your guests in style! Can leave you & your guests spellbound.